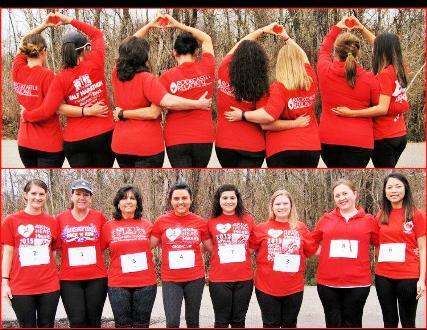 The child development staff from Rockcastle Hospital Child Development Center in Mount Vernon, Kentucky ran a 4K for heart health. In honor of the healthy heart campaign, the staff wore red and enjoyed taking a “heart” picture before the race started. While some staff ran, others walked, and some did a combination of both. They all came together on the weekend to enjoy fresh air and time to better their health. They hope to make the 4K an annual event. The wellness activities didn’t stop at the 4K race. While looking for a group activity that all could participate in, they were inspired by the 5-2-1-Almost None program to start a workplace wellness activity. Five staff members are now enrolled in an employee wellness program that rewards employees participating in physical activity at least 12 times a month. The Rockcastle team has discovered that by working out, they gain energy, which helps them be better equipped to care for the children they serve. Some of the results are better health and happier teachers. Participation in the healthy heart 4K has helped them to continue to run/walk in future local races. The hospital that the child development center is in sponsors a race a month and a discount is provided to the employees that participate. Not only are the teachers able participate in a healthy activity but they can save money while having fun. Nemours Health and Prevention Services (NHPS) created these physical activity guidelines to help promote and support quality physical activity for children. The guide also includes sample child care and early education program policies.